ACME Inc. is building a large fully redundant private infrastructure-as-a-service (IaaS) cloud using standardized single-rack building blocks. They plan to use several geographically dispersed data centers with each data center having one or more standard infrastructure racks. Storage elements, either a storage array, server-based storage nodes, or distributed storage (example: VMware VSAN, Nutanix, Ceph…). 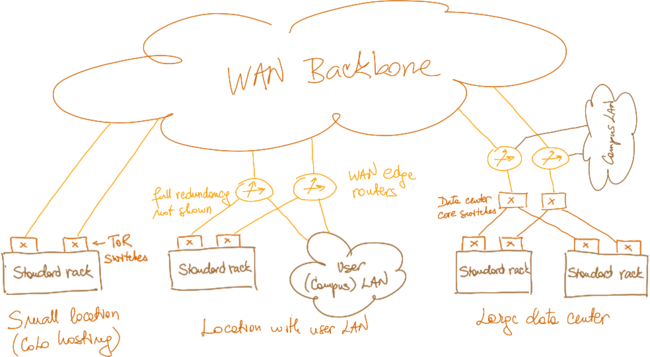 Racks in smaller data centers (example: colocation) connect straight to the WAN backbone, racks in data centers co-resident with significant user community connect to WAN edge routers, and racks in larger scale-out data centers connect to WAN edge routers or internal data center backbone. Minimize failure domain size - a failure domain should not span more than a single infrastructure rack, making each rack an independent availability zone. This case study focuses on failure domain analysis and workload mobility challenges. Typical rack design is described in the Redundant Server-to-Network Connectivity case study, WAN connectivity aspects in Redundant Data Center Internet Connectivity one, and security aspects in High-Speed Multi-Tenant Isolation. Application-level services (example: authentication service, database service, backup service) and associated management and orchestration systems. 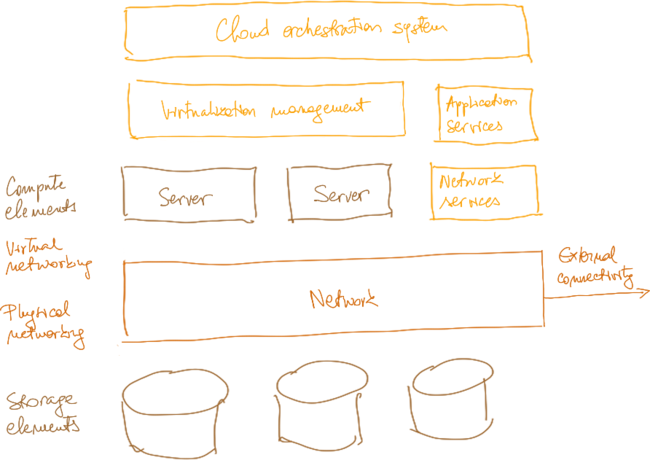 Cloud infrastructure environments based on enterprise server virtualization products commonly use separate virtualization management systems (example: VMware vCenter, Microsoft System Center Virtual Machine Manager) and cloud orchestration systems (example: VMware vCloud Automation Center, Microsoft System Center Orchestrator). Single-purpose IaaS solutions (example: OpenStack, CloudStack on Xen/KVM) include the functionality typically provided by a virtualization management system in a cloud orchestration platform. ACME Inc. wants each infrastructure rack to be an independent failure domain. Each infrastructure rack must therefore have totally independent infrastructure and should not rely on critical services, management or orchestration systems running in other racks.